Video is an important and necessary means to increase your company's profits and acquire good prospects. BLM Productions can handle that need. Videos offer a new dimension in advertising and promotional production. BLM Productions creates videos to promote your business and the services you provide in the Fairfax, VA, area. A DVD can be presented or mailed to prospective clients or shareholders. A digital video can record a special event, a training session, or a how-to class for instruction. These are just some of the many things video can be used for. Bert Morgan of BLM Productions, a professional videographer and documentary filmmaker with over 30 years of video & television experience, can capture the promotion, the use of a product, or training session with video. He understands how important this video can be to your business. Additionally, he creates sports videos for any events you may be interested in documenting. * Coordinating the entire process of the production from scripting, selection of the recording location, and arranging all technical needs. * The final editing of the video master, and assistance in arranging for duplication of the completed DVD project. BLM Productions not only provides the needed technical requirements to create your commercial project, but can coordinate efforts needed to utilize your company's staff to ultimately save your company money in the production process. How do we do that, we get the staff at your company to assist us in creating the project, saving you in extra production costs. To find out how that can be done, contact me at the number shown in the site and I'll be glad to explain how it works. Bring your ideas to life and create a standout promotion for your organization when you work with BLM Productions. Our company offers a series of services in digital media in Fairfax, VA, and the surrounding areas. We help you understand just how important it is to stay competitive in today’s business world. With our promotional production services, you will showcase a project that gets people talking for all of the right reasons. Speak with us today to start on your production job with our professionals. In today’s world of competition, finding ways to stand out is essential for success. Our digital media services allow you to use the ideal advertising to reach your goals. Whatever your project calls for, you can count on us to deliver a professional result for every job. We focus on the details to ensure that every part of your video is flawless. 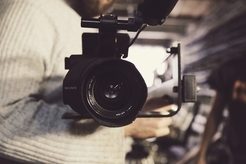 Creating a quality video involves more than just filming segments and piecing them together. It takes a heavy amount of detail to craft the right type of digital media. From scripting to editing and everything in between, you can count on our video production company to take on every part of your project. We are committed to delivering service that fits the needs of your business. No matter what your goals are, we have the right solution for you. Our videos can be used for everything from sports documentation to business advertising. Contact us in Fairfax, Virginia, to learn more about our services. We offer digital solutions throughout the area. Make your business grow with a video. Prospects can see what your business is and how it can benefit them. In todays business world a video presentation is worth it's weight in increased profits. Let BLM Productions create a commercial video for your web site. In business today it is absolutely necessary to join the world of technology to maximize media advertising and gain that edge on others in competition for profits in your market place.